“If I continue to stay here, I am going to be killed,” said a mother of two from Honduras, who spent two months waiting in Tijuana to cross into the U.S.
TIJUANA, Mexico — Lidia wrapped her arms around her six-months-pregnant belly, as she waited anxiously with her daughters, ages 2 and 4, and her husband on a cold January morning at the El Chaparral crossing on the U.S.-Mexico border. The family carried one small suitcase containing their only belongings. They had fled their native Honduras in October after Lidia’s father, brother and cousins were killed by gang members and her own life was threatened. “Almost all of my family has been killed,” she said in Spanish. Now, after a month-long journey north with a migrant caravan, and about two months in Tijuana shelters, they approached the San Ysidro Port of Entry in the hope that their number would be called from a notebook and they would finally be allowed to claim asylum in the U.S. The notebook — worn, gray and geometric-patterned — is filled with columns of the tightly scrawled names of the migrants, along with their home country and a four-digit number that marks their place in line. Every morning, the migrants who maintain the list call a handful of numbers — each one representing about 10 migrants — and that group is allowed to approach the port of entry to claim asylum. As dozens more migrants arrive at the Tijuana border daily, they seek out the keepers of the list to add their names. Officially, the list does not exist. The U.S. and Mexican governments do not acknowledge it. But advocates began hearing about it last year, after the Trump administration instituted a policy of “metering,” or limiting the number of migrants who can claim asylum at a port of entry each day. Advocates and immigration lawyers say this process violates migrants’ right to seek asylum, trapping them for weeks or months in Tijuana — where they are subjected to the violence of local gangs in a city with record murder rates, exposed to the elements in crowded encampments and prevented from starting new lives in America. “I feel that if I continue to stay here, I am going to be killed,” said Lidia, 24, speaking on the condition that her full name not be used, out of concern for her family’s safety. Now, the situation is worsening under the Trump administration's new policy of sending some asylum-seekers back to Mexico after they make their initial claim at the border. Even after their number is finally called on the list, these migrants are returned to Tijuana and forced to wait there as their case plays out, which until now has taken months or even years. Under the policy, 240 asylum-seekers have been returned to Mexico, Department of Homeland Security officials said last Tuesday. As more groups of migrants approach the border, lawyers and advocates fear that Tijuana will get more crowded and more dangerous. That policy of returning asylum-seekers to Mexico has also begun spreading to other border towns this month. What was once the end of an already long and perilous journey to seek asylum in the U.S. has now become the beginning of another ordeal. After leaving Honduras, Lidia and her family endured brutal hours of walking with the caravan, sleeping in parks. She lived in fear that someone would take her daughters. Some days they ate, some they didn’t, she said. When they arrived in the city of Tapachula, Lidia was hospitalized briefly after she couldn’t stop vomiting and suffered a splitting headache. When the family finally reached the border at Tijuana in November, after walking and taking buses for nearly 3,000 miles, their struggles were far from over. The long wait to enter the U.S. has created a backlog of thousands of migrants in Tijuana, including many from Central America. Many are living crammed together in tents without proper sanitation, leading to illnesses that quickly spread, according to lawyers, advocates and Mexican officials. When Lidia’s family arrived, they stayed at the Benito Juarez Sports Complex, Tijuana’s main outdoor facility that housed the thousands of migrants with the caravan. Rain flooded the camp, and it was closed in December over “health issues” and “poor sanitary conditions,” according to Mexican officials. Lidia’s family moved to another shelter, but her daughters, Estefanni, 4, and Katherin, 2, were later hospitalized with breathing problems and had to be treated with nebulizers for asthma. Lidia, who is due to give birth in April, said she sometimes feels “very sick” and still suffers from headaches. The new shelter, called Movimiento Juventud 2000, consisted of an open-air gated area with a roof overhead, which let in cold wind and left Lidia feeling exposed. Other migrants who left Benito Juarez moved to a shelter farther away from the border known as El Barretal, a former nightclub. Hundreds of migrants filled the building’s courtyard and second-floor roof, packed together under tents, some with blue tarp stretched over them. By February, El Barretal was closed, too, with migrants scattering among other shelters. As Tijuana’s migrant population swells, advocates have warned of a rise in violence from organized crime. A record 2,518 people were killed in the city in 2018, including two teenage migrants who were stabbed and strangled during an attempted robbery in December. The violence has spilled over into the new year, with 364 murders through February, according to local reports. The list that decides who enters the U.S. The notebook that determines when a migrant can cross into the U.S. and claim asylum is not an official document. Its keepers are not Mexican or U.S. immigration officials, but migrants who themselves are waiting to enter the U.S. These migrant volunteers say Mexican immigration officials tell them every morning how many people the U.S. will allow in that day. The volunteers then set up shop under a small canopy tent at the El Chaparral border crossing and use a megaphone to call out that day’s numbers to a crowd of hopeful migrants. On a Sunday in late January, a migrant named Veronica, from Acapulco, Mexico, called out 1754 through 1763 — numbers representing 68 people in all, the most she said she had seen all month, including families from Haiti, El Salvador, other parts of Mexico and as far away as Russia. The people whose names and numbers were called made their way to the front of the line, sometimes hugging each other with relief. They then waited for a bus nearby that would take them into the U.S., where they could claim asylum. Veronica, who asked that her last name not be used out of fear of violence in Acapulco and Tijuana, helped to run the list as a volunteer for two weeks as she waited for her number to be called. Emotions can flare if migrants miss their number, as happened Jan. 21 when about two dozen people from Cameroon arrived at El Chaparral after their number had been called. The group gathered around Veronica, some yelling at her to let them into the U.S.
She explained to the group that she could not let them in that day, but if they came early the next day they would be first in line, and they eventually agreed. Advocates argue that the Trump administration’s limits on those who can claim asylum each day violates U.S. and international asylum laws. Her organization filed a class-action lawsuit against the Trump administration in 2017 on behalf of 13 migrants who were told to wait before claiming asylum. The administration is seeking to have the case dismissed. Metering of migrants at the Mexican border was first used by the Obama administration in 2016 in response to thousands of Haitians coming to Tijuana to enter the U.S. By the first half of 2017, the number of Haitians had decreased and the appointment system for them was ended, but by the summer officials were once again turning back migrants, including those from Mexico and Central America. Ramos said she first began hearing about the notebook about a year ago, and she saw it for the first time around May. When asked about the notebook and the asylum process at the Tijuana border, U.S. Customs and Border Protection officials said migrants without documentation “may need to wait in Mexico” as the agency processes others within its facilities. “CBP has always coordinated and continues to work with the Mexican authorities in regards to border security and humanitarian causes,” the agency said in a statement. CBP referred questions regarding processes taking place in Mexico to authorities there. Mexican immigration authorities did not respond to requests for comment. Migrants arriving in the U.S. to claim asylum used to feel relieved. They felt safer than they did in their home country, during the perilous trip or at the border, and they were able to begin building a new life in the U.S. But since the end of January, 240 migrants have been immediately turned back to Mexico after claiming asylum and told to return only when they are due in court in the U.S.
Albert, a Honduran migrant, had prayed for the day his number would be called and he would finally enter the U.S., safe from the criminals who had pursued him in retaliation for his testimony in a robbery case in Honduras. His hopes were dashed in early February, when Albert was told that despite having passed the initial interview as part of the asylum process, he would have to wait in Tijuana for a first court date in San Diego at the end of March. “When the officer told me I was going back, I felt like I was dying,” he said in Spanish through WhatsApp in mid-February. Albert, 35, who asked that his full name not be used out of concern for his safety, joined a caravan last fall after criminals he had testified against in a 2012 robbery were released from prison. He said the Honduran government had promised him protection, but the robbers knew where he lived and left notes warning his mother and wife to prepare for his death. He was devastated to leave his home and his four children, ages 10 to 16, but he felt he had no choice. Many migrants facing long waits in Tijuana have created a temporary life there, finding jobs through humanitarian or work visas offered by the Mexican government. For Albert that new normal meant working at a hockey-stick factory during the day and coming home to a shelter at the Agape Misión Mundial church, where he lived alongside dozens of other migrants. 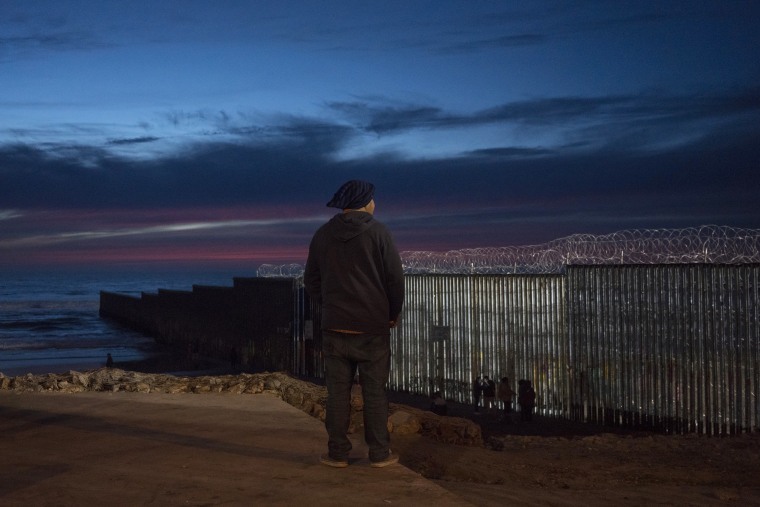 He hoped that once his number was called, he could join a friend in Colorado while waiting for his asylum case to play out, but instead he found himself back in Tijuana, where he fears that the criminals who want him dead could find him. Advocates view the policy of returning migrants to Mexico as just the latest step in the Trump administration's efforts to make the asylum process more difficult for those who present themselves legally at ports of entry along the border. On Feb. 14, the American Civil Liberties Union and two other groups filed a federal lawsuit against the policy, arguing that it puts migrants’ safety in jeopardy and violates their humanitarian protections under U.S. and international law. The suit was filed on behalf of 11 migrants who were returned to Tijuana, as well as on behalf of legal aid groups, including the Tahirih Justice Center, which represents migrant women and children fleeing violence. The Department of Homeland Security did not respond to request for comment on the lawsuit, but has said the policy will "help restore a safe and orderly immigration process, decrease the number of those taking advantage of the immigration system, and the ability of smugglers and traffickers to prey on vulnerable populations, and reduce threats to life, national security, and public safety, while ensuring that vulnerable populations receive the protections they need." After weeks of waiting, Lidia’s family heard their number called in late January. She was relieved to finally cross into America, four months after leaving Honduras, and she was glad the entire family was allowed to stay, at least temporarily. But that happiness was short-lived. Immigration officials determined that she and her daughters had passed their credible-fear interview, which means they may be eligible for asylum, and released them to live in Virginia with her mother, who is also seeking asylum. Her husband, though, has been kept in detention in San Diego, for reasons Lidia doesn’t understand. “I got out. Thank God,” Lidia wrote in Spanish via Facebook Messenger. But she’s worried about her future, with a baby coming in April and a husband unable to help support the family.